Adopt A Highway volunteers at the end of the four hour clean up were, left, Environmental Co-Chairman Barbara Fratila, Adopt A Highway Chairman Nick Fratila, David Pope and Ken Wright. Mascot Hershey sniffs the trash pile. 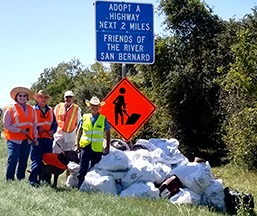 On Saturday, October 1st, trash along two miles of FM 2611 was picked up for first time after switching from FM 2918. Eleven people participated in the clean-up which produced more than 35 trash bags and took four hours to finish. Volunteers (plus those in the photo) were Gabriel Mendez, P. J. Marasciullo, Andrea Marasciullo, Nancy Kanter, Fred Kanter, Karyn Kadera and Mike Goodson.